The Las Cruces / Dona Ana county region can best be described as a high desert area that sees approximately 350 days of sunshine each year. Sitting at approximately 4,500 elevation, the area experiences a temparent climate that is perfect for many outdoor activites from golf to hiking to bicycle riding. 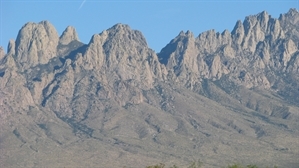 Located next to the Organ Mountains, hiking for all levels is easily accessible. The city of Las Cruces is home to New Mexico State University, a land grant college whose history goes back to the 1800's. The area is close to Spaceport America, where the first commercial space flight is set to occur in 2015. Jan 28.3 F° 43.6 F° 58.8 F° 0.5 "
Feb 32.1 F° 48.0 F° 63.9 F° 0.4 "
Mar 37.1 F° 53.6 F° 70.0 F° 0.2 "
Apr 44.0 F° 60.9 F° 77.9 F° 0.3 "
May 52.9 F° 69.9 F° 86.9 F° 0.4 "
Jun 61.1 F° 78.1 F° 95.1 F° 0.7 "
Jul 67.2 F° 81.1 F° 95.0 F° 1.6 "
Aug 66.2 F° 79.1 F° 92.0 F° 2.2 "
Sep 59.2 F° 73.6 F° 87.9 F° 1.4 "
Oct 46.4 F° 62.7 F° 78.9 F° 1.0 "
Nov 35.2 F° 51.1 F° 67.0 F° 0.5 "
Dec 28.3 F° 43.1 F° 57.9 F° 0.8 "
Spring temperatures are cool with averages in the low 60's and highs in the upper 70's. Nights are cold with lows in the mid 40's. Summer temperatures are warm with averages in the upper 70's and highs in the mid 90's. Nights are cool with lows in the mid 60's. Fall temperatures are cool with averages in the low 60's and highs in the upper 70's. Nights are cold with lows in the mid 40's. Winter temperatures are cold with averages in the mid 40's and highs in the low 60's. Nights are cold with lows in the upper 20's.